One of the most mysterious aspects of modern medicine is the so-called placebo effect. Imagine a drug company that has a new pill. To see if it works, they give one group of people (the “test” group) the real pill and they give another group of people (the “control” group) an identical looking pill that does not contain any medicine (sugar pill). If the the “test” group improves in health and the “control” group does not – voila! – one can conclude that the medicine works. What happens when the “control” group gets better? Hunh? but there was no medicine … how can they get better? This is known as the placebo effect – wherein a persons EXPECTATIONS lead them to feel better. Believe it or not, it happens all the time in scientific research and in the pharmaceutical industry. Apparently the brain has a way of convincing the body that things are getter better (or worse). You probably have probed this complex mind-body interface at some point … “is the pain really in my back, or perhaps just in my head?” Indeed, you can almost hear the frustration among the blue suits in a big pharma board room, “Mind and body are connected?” “How much is this damned mind-body problem going to cost us?” Its a multi-billion dollar problem! Ancient yogis seemed to understand the placebo/mind-body phenomenon. Its a part of what makes yoga so interesting. Its ALL ABOUT THE CONNECTION between mind and body – not one vs. the other. Most folks who practice yoga will attest to its mental and physical benefits. This is true. However, one can still ask the valid question of whether the actual benefits are real? The purely physical benefits (muscles) are not in doubt. But, does yoga really improve a person’s mental life – or do we just want to think so (a placebo response)? I mean, have you left the yoga studio (fully relaxed) only to honk the horn after being cut off in traffic? Did yoga really change you? Is there evidence – in the scientific sense – that yoga leads to mental well-being? Hats off to Dru worldwide – an organization that is “passionate about positive health and wellbeing. 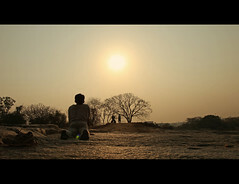 With yoga and meditation at [its] core.” – for taking on this important question! In an article entitled, “The effectiveness of yoga for the improvement of well-being and resilience to stress in the workplace” [PMID: 20369218] published in the Scandinavian Journal of Work, Environment & Health, researchers from Dru Education Center, University of Gothenburg, Harvard Medical School and Bangor University used the scientific method and compared 24 people (mostly women with mean age of 39) who participated in a 1 hour yoga class each week (for 6 weeks) to 24 people who did not participate in the yoga training (the control group). Importantly, these groups were selected at random and showed similar profiles for age, prior yoga experience and health condition. Specifically, the investigators sought to “measure” the effects of yoga using 2 instruments: the Profile of Mood States Bipolar (POMS-Bi) and the Inventory of Positive Psychological Attitudes (IPPA – you can take the assessment here). As noted by the researchers, these questionnaires allow investigators to track changes in both positive and negative feelings. To determine whether the yoga experience conferred a psychological benefit, the investigators measured the POMS and IPPA scores at the start and at the end of 6 weeks and then asked whether the change in score was different between the “test” and “control” groups. The results (nice graph on the Dru website) show that the improvements in score (benefits) were higher in the yoga “test” group than the “control” group (who were on the waiting list for the 6 weeks). In 7 of the 8 POMS-Bi and IPPA domains, scores for the yoga group improved 2–5 times more than those in the control group over the course of this study. The interaction term from a two-way ANOVA showed that in comparison with the control group, the yoga participants at the end of the program felt significantly less anxious, confused, depressed, tired, and unsure, and had a greater sense of life purpose and satisfaction and were more self-confident during stressful situations. Although the yoga group reported feeling more agreeable (less hostile) than the control group at the end of the program, this difference was not statistically significant. Thus, the research team validly concludes that the yoga experience was associate with improvements in mental well-being. This is remarkable given the small size and short duration of the study. I do recall, when I first started yoga (9 months ago) that I felt sooo much better, so I think I can understand what the participants might have been feeling. Because participants in our study were self-selected, it can be assumed that they were a highly motivated group who wanted to practice yoga. Participant expectations may have included a desire to feel less stressed by the end of the six-week sessions and this may have contributed to their perceived benefit. So, the data suggest that yoga made a contribution to the mental well-being of the participants. This is a valid conclusion – and hats off to the research team for conducting the study. Are the effects “real” or “just in the mind” of the participants? Does it really matter? Personally, I don’t think so. That’s the fun of exploring the mind-body interface via yoga and meditation. Not “knowing” but rather, just “feeling”! As a parent, there are times when I realize that the world of my children is not the world I grew up in. Yes, the Readin’, ‘Ritin’ & ‘Ritmetic are still just as important … and there is nothing as precious as apple pie and little league in the spring … and yes, kids must eat their vegetables and say their prayers at night. Just as its always been – and will always be. The wider technological and economic world of my children, however, is much different – most obviously altered by the recent rise of computer technology that “creatively destroys” all forms of industrial activity (media, finance, trade, healthcare) across the globe. Such change, while unsettling, is, itself, nothing new. Just teach the children to adapt and, like every generation before, your children will be fine. OK. In particular, the team was focused on the neural systems that help us pay attention. David Strayer, a psychology professor at the University of Utah, says that studying what happens when we step away from our devices and rest our brains — in particular, how attention, memory and learning are affected — is important science. “Attention is the holy grail,” Mr. Strayer says.” “Everything that you’re conscious of, everything you let in, everything you remember and you forget, depends on it. Every parent knows that kids are increasingly hooked on this and that computer device. We know that these devices constantly serve up all manner of entertaining news, sports scores, gossip, visual images, games, etc. etc. 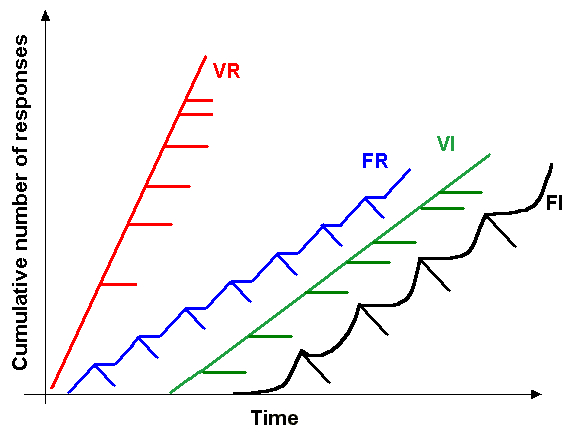 Unfortunately, we also know that so-called “intermittent reinforcement”, “variable ratio of reinforcement” or “random reinforcement” can be just as addictive as any drug (the red line in the chart here shows how much more reinforcing “random” rewards are than fixed, predictable rewards). This is why these devices are – in every sense of the word – ADDICTIVE. They offer up a steady, but unpredictably so, stream of rewarding images and bits of information. I mean, how many times a day do you check your email and favorite websites? Do you feel disappointed when there is nothing juicy – but can’t help checking “just one more time”? Hence, computer technology presents a quandary for all of us – grown ups and kids alike. How to adapt to, and manage this “new normal” of hand-held, computer-based, ubiquitous access to social and entertainment information? When he gets back to St. Louis, he says, he plans to focus more on understanding what happens to the brain as it rests. He wants to use imaging technology to see whether the effect of nature on the brain can be measured and whether there are other ways to reproduce it, say, through meditation. 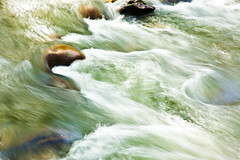 Boy, it sure would be nice to head out with the kids and shoot the rapids for a few days every time I felt overloaded! Unfortunately NOT one our our family’s economic realities! Professor Braver’s comments on reproducing the effect of the rafting trip through meditation, however, got me wondering, and also reminded me of a quote that is painted on the wall of my yoga shala – from the 13th century Persian poet, Rumi. Hmmm, this kind of stuff is oft said about meditation. As many parents fret about their way kids become attached to their digital devices, it is perhaps too early to know whether meditation is an effective counter-balance to the new digital reality. Can it provide the same cognitive and emotional benefits experienced by the river rafters who were truly “disconnected” for a few days? Perhaps – with practice, and more practice. Nevertheless, a relaxing walk through the forest is different for kids today – as their digital devices buzz away in their pockets. What’s a modern-age kid to do? To begin to explore this question further, check out these 2 review articles on the physiological and psychological benefits of both meditation and yoga in children. The first, Sitting-Meditation Interventions Among Youth: A Review of Treatment Efficacy by David S. Black, Joel Milam and Steve Sussman, published in Pediatrics Aug 24, 2009 and Therapeutic Effects of Yoga for Children: A Systematic Review of the Literature by doctors Mary Lou Galantino, Robyn Galbavy and Lauren Quinn from the University of Pennsylvania. Its fun to meditate and fun to spend quiet time with my young children – so there is no real downside to spending some time meditating and “disconnecting” from our digital devices. Might they be learning a skill that protects their creativity and emotional well-being? I hope so. Perhaps one day when they are older, they will email me to let me know! To learn more about meditation for children, visit The David Lynch Foundation, UCLA Mindful Awareness Research Center (adapting ancient practices to modern life), the Committee for Stress-Free Schools, Dr. Elizabeth Reid’s six week curriculum to encourage mindful learning in a class of fourth grade students and an interview with my former postdoctoral mentor on the science of attention training. Have you ever noticed how everything healthy these days is “anti-oxidant” this and “anti-oxidant” that? Green tea, dark chocolate, vitamin E and vitamin C – just to name a few. Surely, its all the rage to be “anti” oxygen these days (indeed, there are currently 458 clinical trials open now for the study of anti-oxidants!). But wait. Isn’t oxygen the stuff we BREATHE? Don’t we need it to live? How can we be so “anti” oxidant? Herein lies a very sobering chemical fact of life. We need oxygen to breathe – while at the same time – the very same oxygen produces so-called reactive oxygen species (hydrogen peroxide, hypochlorous acid, and free radicals such as the hydroxyl radical and the superoxide anion) which cause damage to our lipids, proteins and even our genome. What gives us life – also takes away life – a little bit each time we breathe. Such is the basis for the healthy foods and myriad dietary supplements that (promise to) counteract and biochemically scavenge the toxic reactive oxygen molecules in our bodies. But for the fact it would make me even fatter, I’d promptly say, “Bring on more dark chocolate!“. But what if we could just forgo all those dietary supplements, and just USE LESS oxygen? Might that be another way to enhance longevity and health? With this thought in mind, I enjoyed a research article entitled, “Oxygen Consumption and Respiration Following Two Yoga Relaxation Techniques” by Drs. Shirley Telles, Satish Kumar Reddy and H. R. Nagendra from the Vivekananda Kendra Yoga Research Foundation in Bangalore, India. The article was published in Applied Psychophysiology and Biofeedback, Vol. 25, No. 4, 2000. In the results and discussion of the data, they found (using a sample of 40 male adults) that the when they measured oxygen consumption at the beginning and at the end of the session, that the yoga postures/rest routine (CM) resulted in a 32% reduction in oxygen consumption (this is the amount of oxygen used when sitting still at the end of the session) while just laying in shavasana led to only a 10% reduction in the amount of oxygen used at the end of the session. Wow! So even after moving through postures – which admittedly gets one’s heart pumping and elevates one’s breathing – I would be using less oxygen (when sitting at the end of the session), than if I had just decided to lay in a supine position. In this instance, I guess I may be using more oxygen overall during the session, but perhaps would be glad to improve the efficiency of my breathing – and intake of oxygen – in the long run (after many years of practice I’m sure). Maybe this is a physiological/biochemical basis for the longevity-promoting benefits of yoga? How does the effect work? Does the act of moving in and out of postures engage the sympathetic nervous system (something not observed for shavasana)? Much to explore here. The authors point out that these effects on improving the efficiency of breathing and oxygen consumption may not be specific to yoga, but to any MODERATE exercise regimen, where exercise and some sort of mental focus is practiced (Tai Chi for example). Move and pay attention to your breath. I will keep this in mind tonight in my beginners class. By the way, there are currently 93 clinical trials involving yoga!